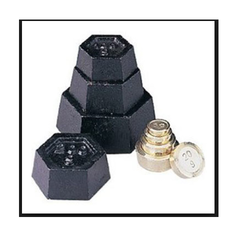 We are engaged in manufacturing a wide range of metric weights like Metric Weights, Cast Iron Testing Weights, 20 Kg Test Weights/ Cast Iron Weights/ Standard Weight etc. Our range of Cast Iron Weight Ranges from 20kg to 5000kg. The products can be tailored in accordance with the requirements of our clients and are also available in economical prices. Specifications The Standard Weights & Measures (General) Rules 1987 & The Standard Weights & Measures (General) Second Amendment Rules'2004 & OIML also recommended this vide R-52, for normal use in trade and commerce & vide R-47, for testing the accuracy of high capacity weighing machines. The Standard Weights & Measures (General) Rules 1987 & The Standard Weights & Measures (General) Second Amendment Rules'2004 & OIML also recommended this vide R-52, for normal use in trade and commerce & vide R-47, for testing the accuracy of high capacity weighing machines. Adjusting Cavity 50kg to 50kg Weights are having an Adjusting Cavity at the bottom of the weights 1000kg to 100kg Weights are having an Adjusting Cavity at the side of the weights. 50kg to 50kg Weights are having an Adjusting Cavity at the bottom of the weights 1000kg to 100kg Weights are having an Adjusting Cavity at the side of the weights. Material Grey Cast Iron Body& Mild Steel Handle of 1000kg to 5kg. Grey Cast Iron Body& Mild Steel Handle of 1000kg to 5kg. 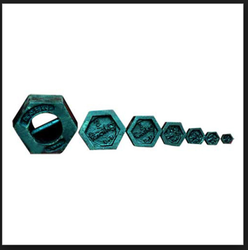 Shape 50kg to 5kg Hexagonal with all the sides conically tapered towards top and the remaining towards bottom 1000kg to 100kg Rectangular with no sharp edge on corners 50kg to 5kg Hexagonal with all the sides conically tapered towards top and the remaining towards bottom 1000kg to 100kg Rectangular with no sharp edge on corners. 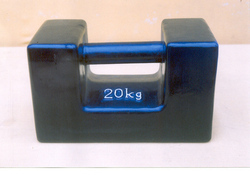 Presentation "Loose Weights" "Loose Weights"
Our range of cast iron weight ranges from 20kg to 5000kg. The products can be tailored in accordance with the requirements of our clients and are also available at economical prices. Shape 50kg to 5kg Hexagonal with all the sides conically tapered towards top and the remaining towards bottom 1000kg to 100kg Rectangular with no sharp edge on corners. 50kg to 5kg Hexagonal with all the sides conically tapered towards top and the remaining towards bottom 1000kg to 100kg Rectangular with no sharp edge on corners. Our range of metric weight castings, is coated with chrome. This helps these in remaining rust and corrosion free. The products can be tailored in accordance with the requirements of our clients and are also available in economical prices.